The world economy has been letting us down for years and there’s a lot of blame to go around. 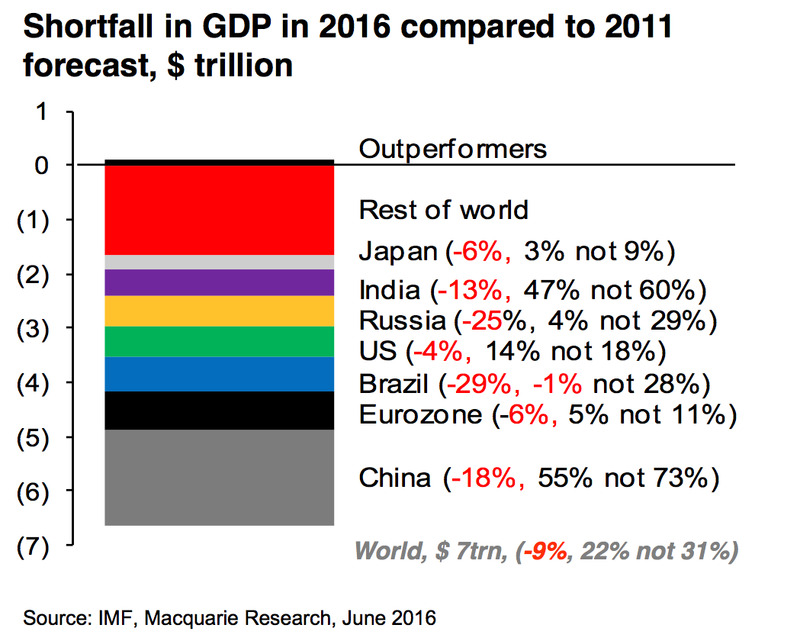 The disappointing reality was laid out in a chart from Macquarie which compared the actual GDP growth from 2011 to 2016 to the 5-year outlook from the International Monetary Fund. All in all, the world had undershot growth expectations by 9%, growing 22% over the timeframe instead of 31% as projected. The letdown was widespread with everyone from the eurozone to India contributing to the short fall in world GDP. 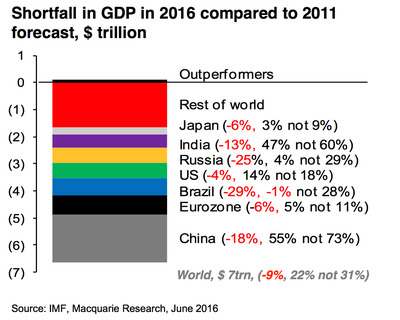 The biggest shortfall (outside of the catch-all “Rest of world”) in terms of total growth has been China, while the largest in terms of per cent growth was the 29% miss by Brazil. While this is probably partly poor prognosticating on the part of the IMF, their global GDP growth chart is a fishhook collection of economic sadness, it also speaks to how many maladies have befallen the world’s economy since the global financial crisis.